TORONTO, June 25, 2018 /CNW/ - J.P. Wiser's has launched a series of limited editions in celebration of the craftmanship and rich heritage of Canadian whisky. Building off the success of J.P. Wiser's commemorative bottle 'One Fifty', J.P. Wiser's has launched 'Canada 2018', a unique and limited edition Canadian whisky crafted to toast Canada's Birthday. The 'Canada 2018' bottle features a Canadian map to pay tribute to the 200th anniversary of the 49th parallel – the border that defined Canada as a country. "As a Canadian brand that has been around since the very beginning of Canada's history, we wanted to continue the legacy of commemorating milestones and to celebrate the country we call home." says Keeshan Selvakumar, Senior Brand Manager, Corby Spirit and Wine. 'Canada 2018' offers a palate of sweet green apple, dried fruit, oak and subtle clove with a slight rye spice finish. J.P. Wiser's Canada 2018 can be enjoyed neat or on the rocks. This limited edition bottle is available in select stores across Canada. J.P. Wiser's Seasoned Oak is Master Blender Dr. Don Livermore's latest release following two award-winning whiskies: J.P. Wiser's 'Last Barrels' and J.P. Wiser's 'Dissertation'. "JP Wiser's Seasoned Oak is a 19-year-old blended rye whisky that was finished in casks, where the white oak was dried in the natural environment for over 4 years before the barrel was constructed," says Dr. Don Livermore. "This seasoning step in the environment helps breakdown the wood extracts, which creates a unique balance between the whisky and the premium oak casks. To match the 48-month seasoning process, the strength of alcohol for J.P. Wiser's Seasoned Oak is 48% abv. This is a must-have for anyone who collects Canadian Whisky." ­­Exclusively at LCBO for $99.95, 'Seasoned Oak' provides a premium offering perfect for gifting and whisky connoisseurs. Corby Spirit and Wine Limited is a leading Canadian marketer and distributor of spirits and imported wines. 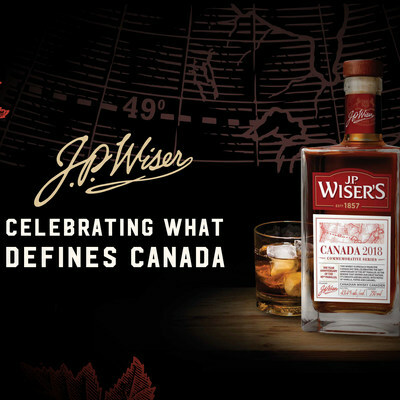 Corby's portfolio of owned-brands includes some of the most renowned brands in Canada, including J.P. Wiser's®, Lot No. 40®, Pike Creek®, and Gooderham & Worts® Canadian whiskies as well as Lamb's® rum, Polar Ice® vodka, McGuinness® liqueurs, and the recently acquired Ungava® gin. Through its affiliation with Pernod Ricard S.A., a global leader in the spirits and wine industry, Corby also represents leading international brands such as ABSOLUT® vodka, Chivas Regal®, Aberlour® and The Glenlivet® Scotch whiskies, Jameson® Irish whiskey, Beefeater® gin, Malibu® rum, Kahlúa® liqueur, Mumm® champagne, and Jacob's Creek®, Stoneleigh®, Campo Viejo®, and Kenwood® wines. In 2018, Corby was named one of the 50 Best Workplaces in Canada by The Great Place to Work® Institute Canada for the seventh consecutive year. Corby is a publicly traded company based in Toronto, Ontario, and listed on the Toronto Stock Exchange under the trading symbols CSW.A and CSW.B. For further information, please visit our website or follow us on LinkedIn, Twitter (@CorbySW) and Instagram (@CorbySW).